Effective sire selection is a daunting process for many seedstock and commercial beef producers. Indeed, more than one or two traits affect profit in beef cattle enterprises. A vast array of EPD makes selection challenging and depending on breeding system and marketing methods, traits have different economic values (contributions to profit) across enterprises. Selection index provides a broad methodology for optimally weighting EPD which have economic importance to various defined breeding objectives. Selection indexes, when properly aligned with marketing endpoints, can substantially simplify sire selection decisions by focusing selection on a single metric associated with enterprise profitability. Use of selection index can help producers focus selection pressure on economically relevant traits in a consistent way across years and seedstock vendors. Addition of genomic data to EPD computation systems adds accuracy to the resulting EPD and selection indexes derived from them. Why do we need indexes? The idea of a yardstick or selection index for measuring the net merit of breeding animals is probably almost as old as the art of animal breeding itself. In practice several or many traits influence an animal’s practical value, although they do so in varying degrees. The information regarding different traits may vary widely, some coming from an animal’s relatives and some from the animal’s own performance for traits which are expressed once or repeatedly during its lifetime….These factors make wise selection a complicated and uncertain procedure; in addition fluctuating, vague, and sometimes erroneous ideals often cause the improvement resulting from selection to be much less than could be achieved if these obstacles were overcome. Hazel points to the complexities of selection of individuals when many traits are observed and when the ‘information’ or performance record of an individual and its ancestors, collateral relatives and progeny may vary considerably. The overall net merit of the individual, considering several traits of economic importance, provides a superior selection criterion than single trait selection or multiple trait selection via independent culling levels. Hazel’s pioneering work solidified the idea of a breeding objective or goal using a quantitative method. The aggregate genotype described by Hazel was a linear function (selection index) of observations such that the observations of each trait were weighted by the relative economic value of that trait. The result was a single value for each animal that represented an objective valuation of the overall satisfaction with that animal. In production agriculture, our level of satisfaction with an animal or system is generally measured in profit. The selection index provided a natural connection between the net merit of an animal’s genotype and its relationship with profit. 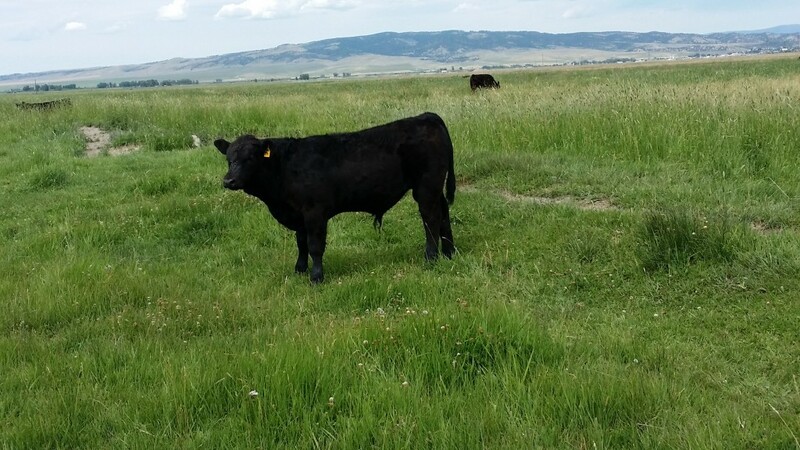 As beef producers, we know that more than one trait exhibited by beef cattle contribute to profit at the enterprise level. Clearly, a cow-calf producer that sells calves at weaning depends on more than just the average weaning weight of calves for profitability. Simple ranch accounting suggests that reproduction rate, calf survivability, cow maintenance feed costs, length of productive life and others influence the total pay weight of weaned calf produced and the cost required to produce that weight. Likewise, the producer that sells calves at harvest relies on more than just marbling score or quality grade to pay the bills. Reproductive rate of the cow herd, maintenance costs, longevity, not to mention carcass weight, are all factors affecting profitability. Thus, breeding objectives should include all the traits that are of economic relevance. Recently there’s been a flurry of activity by researchers and breed associations to develop a variety indexes. A majority of these indexes are end-point or marketing point focused. These generalized indexes are applied on a breed-wide basis. Generalized indexes are appropriate whenever breeding objectives are consistent across large segments of an animal population. Bio-economic simulations are relatively robust across deviations in input costs or product pricing in that the spread of the index value may not match realizations at the ranch level but the ranking of candidate sires is still correct. In beef cattle selection, rank of animals (i.e. selecting the ‘best’) is generally more important than the values associated with index or EPD. At present a number of breeds have developed selection indices for use by seedstock and commercial producers. Table 1 below describes the breed association, index name, market progeny end-point and breeding system type (M=maternal trait, R=replacement female, T=terminal or A=all purposed with terminal calves and replacements retained) and index type (C=customizable or G=generalized). Which Index Should I use? For commercial cattlemen that can succinctly define their market endpoint, the selection of sires within breed is dramatically simplified through the use of a selection index. The key to success is the selection of the appropriate index by aligning the market endpoint of the index with your operations endpoint. Misalignment of index and market endpoint is the most often observed mistake in the use of selection index. For instance using a carcass endpoint selection index (such as $B from Angus, CHB from Hereford, TI from Simmental, MTI from Limousin, CV from Gelbvieh, TSPI from Charolais) for replacement female selection or for selection of sires of replacement females is strongly discouraged. These terminal indexes put zero (0) economic weight on maternal traits which should be the focus of selection for a replacement female. Use of terminal indexes to select sires of replacement females will result in selection for terminal traits. Ultimately, using a terminal selection index to produce replacement heifers will produce larger mature weight cows that are likely leaner in body composition. For many producers that retain heifers from the breeding program and sell either feed cattle or retain ownership through the feed, use of an all-purpose or replacement heifer index is advised. These indexes provide significant weighting on maternal traits such as stayability, heifer pregnancy, maternal calving ease, and milk which can dramatically influence to productivity of daughters retained in the herd. Selection index provides a more efficient selection strategy than other forms of selection. Tandem or sequential selection is sometimes used in the beef industry. Tandem selection is the process by which a breeder places pressure on one trait at a time and when selection attains a desired level of performance in the first trait selection pressure is applied to the second trait and so on. This process can be slow and imprecise. Economic gains are dependent on knowing which trait to select for first in the order, what level of a trait maximizes profit and what the economic value is for each trait. Selection index is also more effective for multiple trait selection than the use of independent culling levels (ICL). ICL is the process where minimum or maximum thresholds are established for each trait under selection. Animals that achieve all the thresholds are selected. The risk of ICL is that it omits animals that maybe of high value in aggregate, but just miss one of the threshold values. Selection index applies weightings to all traits of economic relevance to the goal or endpoint and ranks animals on the aggregate merit so no animal of significant value is omitted from the selection candidate roster. The principal impact of genomically enhanced EPD (GE-EPD) on selection index is through increased accuracy of prediction for EPDs on which the various selection indices are based. Improvement in accuracy of EPD yield more reliable selection indices. The incorporation of genomic (DNA marker) information into national cattle evaluation systems has the opportunity to increase the accuracy of young sire selection candidates. Reduction of risk through improved EPD accuracy of these young candidates adds substantial value to EPDs and resulting selection indices for use by both seedstock and commercial breeders making selection decisions. Click here for printable pdf version of this article.